﻿Lailatul Barat: Calendar, History, Tweets, Facts, Quotes & Activities. Lailatul Barat (Arabic: شب برات) commemorates a night that Muslims believe God descends from heaven and forgives sins very generously. For that reason, Muslims spend the night in prayer, and fast the next day. 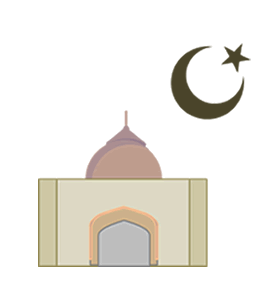 Lailatul Barat occurs in the middle of the month of Sha'ban, the month before Ramadan. It is considered one of the holiest nights on the Islamic Calendar. The night begins at sundown on the 14th and ends at dawn on the 15th of Sha'ban. Muslims are recommended to fast at least six days of this month. Often, women who missed fasts because of menstruation in Ramadan make them up in this month. According to Islamic tradition, the Prophet Muhammad fasted more in Sha'ban than any other month. In the Arab world, Lailatul Barat is called Laylatun Nisf min Sha'ban, which translates to the night in the middle of Sha'ban. In Afghanistan, Iran, Bangladesh, Pakistan, and India, however, Shab-e-Barat is used, which means 'Night of records'. Muhammad discouraged his companions, Abu Huraira in particular, from fasting before the 15th of Sha'baan because he feared for their physical health. Therefore, this night marks the night when Muslims may begin fasting again after Ramadan. A companion of Muhammad, Usama ibn Zaid, once asked him, Messenger of Allah, I have seen you fasting in the month of Sha'ban so frequently that I have never seen you fasting in any other month. Prophet Muhammad replied: That (Sha'ban) is a month between Rajab and Ramadan which is neglected by many people. And it is a month in which an account of the deeds (of human beings) is presented before the Lord of the universe, so, I wish that my deeds be presented at a time when I am in a state of fasting. In most places in the world, this night involves festivities, cooking, and staying up all night in prayer. Schools are often off the next day, to give young children a chance to recuperate. In some regions of the world, people visit graves and commemorate their ancestors on this night. In addition to worshipping all night, Islamic traditions encourages Muslims to fast on the 15th of Sha'ban.